Obwona in Intensive Care Unit at St Mary’s Hopstal Lacor in Gulu. David Okema. AMURU. Three people have been confirmed dead in land clashes in Zoka at the border between Amuru and Adjumani districts. Police said the clashes pitting the Acholi community from Amuru and their Madi counterparts from Adjumani saw arrows and machetes ferociously exchanged leaving 14 others seriously injured. The injured are being attended to at St Mary’s Hospital, Lacor. PML Daily confirmed five other injured persons were being treated at Pabbo Health Centre. Saidi Nyeko, a resident of Acholiber, Bosco Okwera Oringa, 23, from Lulai village in Apaa parish and another person whose identity could not be readily established were killed in the clashes. The bodies have been taken to Gulu Regional Referral Hospital mortuary. 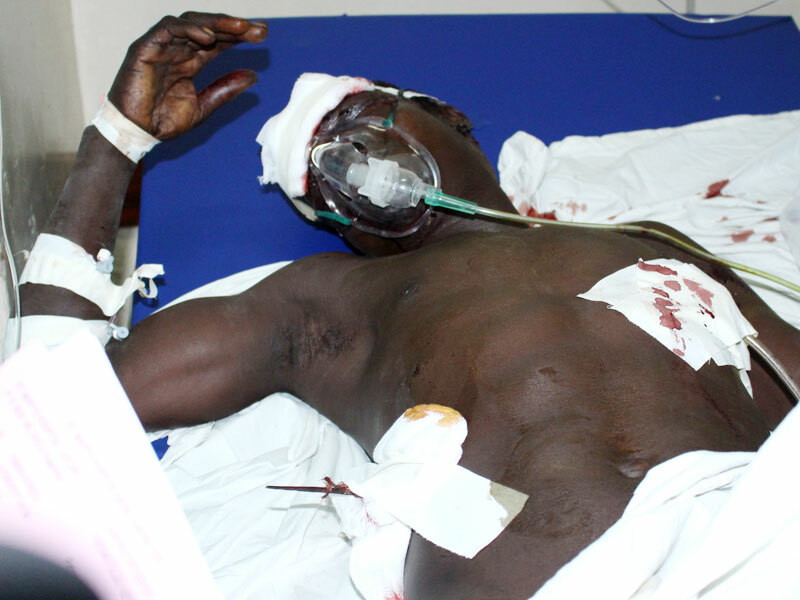 Among the critically injured are Maureciencio Obwona, 43, Patrick Onen, 22, Thomas Otim, 23, Charles Okello, 45. Bosco Otim, Aswa River Regional Police Commander, said by yesterday during a joint meeting between the community, Aswar river police and Northwest region police, unidentified number of huts was confirmed to have been burnt in the village of Zoka in Apaa. Meanwhile, a resident who preferred anonymity for fear of reprisal, told PML Daily today that the entire village of Zoka of over 200 huts had been torched the previous evening. PML Daily could not readily establish the veracity of the claims. Charles Okello’s leg was shot with an arrow. David Okema. During yesterday’s meeting with the community, residents said, on June 2, a market day at Apaa trading centre, a group of Acholi blocked 10 Madi people and warned them never to come to Apaa market again. On Sunday night, Fred Chandika’s four huts were torched by unknown assailants. On Monday, an anonymous letter was found in Zoka, warning a person named Okeke and the Madi community never to cross River Terekwa to Apaa area. Yesterday, between 7am to 11am, gangs of Madi, armed with spears, bows and arrows, and machetesm stormed the Acholi in Zoka and killed two people in the ensuing clashes. Aswa police’s Okema said the incident was unfortunate. “We (police) are all the time managing Apaa land issue yet the people who know the root causes and can settle it are out there,” Okema said, appealing to those with facts on the land wrangles to come out to settle the Apaa land issue. Yesterday, a team of Amuru leaders, including, Lucy Akello, Women Member of Parliament, condemned the act and called upon leaders of Amuru and Adjumani to intervene. However, Okema said police from both regions of Aswa River and Northwest Nile in a joint operation with strong patrols carrying out surveillance. He said a police post has been installed to carry out more investigations but that no suspect had been arrested in connection with the deadly attacks yet. The land dispute betweeen Acholi and Madi, which started in 2012, has so claimed more four people. Caption: Obwona in Intensive Care Unit at St. Mary’s Hopstal Lacor in Gulu. Okello Charles with arrow stacked.